Can you believe that 2012 is just around the corner? Hopefully you are as excited for the New Year as we here at the library are. Do you have your resolutions picked out yet? On December 10th, the library successfully held its annual Gingerbread House Family Program. It was as entertaining and messy as ever. We hope that all of the families had as much fun constructing their graham cracker and candy houses as we had watching them do so. If you're lucky, your family's photograph may appear in next year's newsletter, so keep an eye out! December's copy of Unwritten, the collection of poems all written by patrons, is out now. 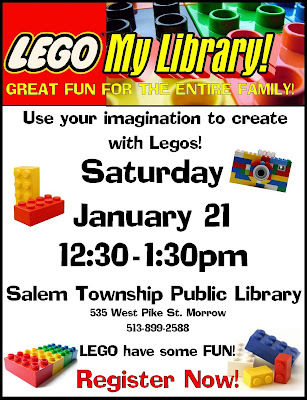 It's great fun at the Salem Township Public Library! Families are invited to our first LEGO My Library! party on Saturday, January 21 at 12:30pm. Let us know that you will be coming! We provide the Lego bricks. If you have Lego or Duplo brick sets, that are no longer being used, please donate them to the Salem Township Public Library. Your generous donation will put happy smiles on many little faces!